If one of the pillars of a digital workplace is digital tools and technologies, the other is digital talent and skill sets that enable organizations to implement digital initiatives. In fact, the need to attract and recruit digital workers has become so important that there are now technology platforms to automate, organize and promote increasingly complicated workplace programs that are designed to incentivize digital workforces. There are many advantages to this, not least of which is ensuring that money spent on employee engagement has maximum impact on digital workplaces. “Robust and well-organized workplace programs are no longer a luxury, they are a requirement to attract and retain top talent,” said Alex Shubat, CEO of Palo Alto, Calif.-based Espresa, in a recent statement. The deployment, or use, of such a platform, may appear a luxury in organizations where closing sales and ensuring customer engagement take priority. However, the emergence of digital workplaces has changed the way organizations have to recruit, how they manage and retain talent, what that talent expects and how it works. Here are seven ways the emergence of digital tools and technology in the workplace have changed the way companies recruit, how they retain talent and how workers expect to work. Bill Donoghue is CEO of Dublin, Ireland-based Skillsoft, which provides cloud-based learning and performance support resources. He said one of the major changes for human resources will be the introduction of automated recruitment. He points out that the job market is booming with thousands of candidates’ applications. Candidate sourcing and candidate screening needs to be more automated with intelligent and relevant recommendations through machine learning. “Candidate outreach will improve through appropriate big data analysis of recruiting and hiring data. This will allow for better candidate selection through prescriptive analytics to determine who, when hired, would stay in that job longer,” he said. Digital transformation is driving a convergence of business and management skills with traditional IT skills, according to Donoghue. This technological momentum is causing organizations to rethink organizational structures, roles and required skillsets and capabilities. This means technology skills aren’t enough. In order to improve recruitment and increase retention, companies need to give more thought to soft skills, like communication, leadership, culture and team fit. And according to Donoghue this is making some skills difficult to source. “There is a major gap in skillsets and capabilities that organizations will be seeking to fill. In the upcoming year, employers will be looking to fill gaps with both hiring and employee training in critical areas of digital transformation,” he said. New transformational technologies, such as the Internet of Things (IoT), artificial intelligence (AI) and robotics combined with new capabilities such as design thinking, and data science are changing the nature of customer relationships, internal processes, business models and value propositions. 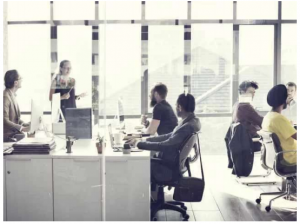 All these developments are being driven by workplaces that are being shaped by millennials as organizations struggle to adapt to the needs of these highly digitalized workers, according to Colin Doherty, CEO of Boston-based Fuze, which provides enterprises with cloud-based unified communications-as a-service. “The incoming workforce is all about texting and video chat. When I walk around our office, I see so many of our younger employees on video calls and text chats with colleagues. They may click in or out periodically but are engaged in the conversation almost the entire day,” he said. Business leaders will need to observe and understand which communication modalities are natural to their teams and adjust accordingly. “Video team meetings may not be the first preference of a baby boomer leader, but if it’s the preferred mode of communication for your team, that’s what they should use,” he added. In fact, according to Joelle Kaufman, CMO of San Bruno, Calif.-based Dynamic Signal, which develops an employee communication and engagement platform, employee engagement is key to keeping digital talent. It has become clear, Kaufman said, that communication is at the beginning of a major transformation, like the one marketing experienced over the last decade or so. “The technology that has transformed how we communicate in our personal lives will continue to find its way into the workplace. Employee expectations for communication have modernized and the enterprise has an urgent need to evolve to meet these new requirements,” she said. She argues that as these changes evolve, it is imperative that companies focus more on the employee experience to survive in today’s always-on mobile world. While collaboration tools are a step in the right direction, they often add to the noise with no way to prioritize important messages or measure message penetration, causing employees to miss important information they need to do their jobs well. Companies will suffer the negative business impact of disengaged, disconnected employees if they don’t prioritize internal communications. It is the C Suite that needs to take the lead on this. “It is up to executives to lead the way. We will see even more adoption of intelligent communication technology with a focus on mobile, so businesses can ensure employees are engaged and informed with relevant, timely, personalized news,” she said.